The impact on Northumberland’s wildlife as a result of littering has been revealed in a new video. The RSPCA receives around 5,000 calls a year about litter-related injuries to wildlife and in Northumberland animal welfare organisations are seeing first hand the damage discarded rubbish can have on animals. The new film highlighting the dangers animals face forms part of the council’s ongoing campaign encouraging motorists to help keep the county clean and green. Northumbrian Hedgehog Rescue Trust cares for and rehabilitates hundreds of hedgehogs each year, some of which have suffered traumatic injuries as a result of getting entangled in roadside litter. Carole Catchpole, who launched and has run the charity for 20 years, said animals can die ‘horrible deaths’ if they get caught in cans or plastic ties, such as those which hold beer cans together. She said: “I can’t understand why people, especially in this day and age, can’t bring their rubbish home with them. Litter and rubbish which is either dropped in the street or thrown from vehicles casts a real blight and clearing up litter costs the council around £2.6m each year. The council’s roadside litter campaign has a simple message - it’s asking people not to drop litter and be proud of their county. Advertising has been running on the backs of buses around the county, as well as on petrol pumps, reminding drivers and passengers not to drop rubbish from their vehicles and ‘love their county’. 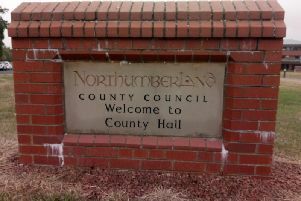 Coun Glen Sanderson, Cabinet Member for Environment and Local Services, with Northumberland County Council, said: “Littering can have so many impacts and the effect it can have on wildlife really is distressing. “Animals can suffer truly horrific injuries and often death caused by thoughtless people who have thrown a can or carton from their vehicle.